I will be speaking on "Decreasing Campus Energy Use With Flexible Classrooms and e-Learning" at EduBuild 2018 in Singapore, 9 October, 5:20pm. This is a new part of the annual EduTech conference, focusing on classroom design and use. ps: The next day at EduBuild I will be taking part in a discussion of "Learning to use new tech-infused teaching spaces". Greetings from the Australian Computer Society (ACS) in Sydney. I am a member of the ACS Blockchain Technical committee and taking part in a workshop with people from industry and academia. We were looking for use cases, so I suggested education, specifically blockchain for micro-credentials. Educational qualifications much shorter than current diplomas and degrees is a hot topic in Australian vocational and higher education. What takes this beyond a theoretical discussion is New Zealand recognizing Micro-credentials from 22 August 2018. A NZ micro-credential is equivalent to about 1 to 8 weeks study. So in addition to accumulating perhaps a half dozen macro-credentials during their career, an individual may have hundreds of micro-credentials. It would be cumbersome to manage these on paper, or through a centralized computer system. The micro-credentials may then be automatically checked for some jobs by automated systems. I will touch on this in my talk on mobile education for the Computer Society of Sri Lanka National IT Conference (NITC 2018), 2 to 4 October. Students could study and be tested via their mobile device and then their digital certificate provided via the same device. For the next few months I will be speaking at conferences, and on industry committees preparing policy, so can't tutor ANU TechLaucher, as I usually do. Instead I volunteered to be a standby tutor, a like Star Trek's Emergency Medical Hologram. Last week the usual tutor was not available, so I took a class for the first time. It is a little daunting walking into a classroom mid-semester with a room full of experienced students who have bonded into teams. So I decided to treat it like a job application, and put up on screen my LinkedIn profile. The students were not that impressed with my past work, as much of it is from before they were born. However, there were interested in my 700+ contacts, and asked how does someone starting out get these. My answer was that they need to gain experience outside their their course and that will be assessed in their last assignment. This was a little off topic for the tutorial, which was supposed to be about hearing from them where their projects are up to. However, I pointed out that the Work Portfolio Package, their last assessment item (worth 20%), requires them to write a job application and provide evidence of how professional they are. A large part of being professional is learning to learn, and learning to work with people. A previous version of ANU Techlauncher required a reflective portfolio, where students commented on their learning. However, this is a very abstract concept to get across to students generally. It is particularly difficult for STEM students to understand the relevance of reflection (it is easier for educators from a social science). I still have difficulty with reflection, even after successfully completing a portfolio for an MEd capstone, for fellowship of the Higher Education Academy and most recently for the ANU Technology-Enhanced Learning in Higher Education Certificate. For TechLauncher, the reflection was recast as a job application. The student has to explain how their experience during the course is relevant to a real job. This is essentially the same learning reflection exercise, but in a format which is very relevant to a final year student who will soon need a job. What many students have difficulty with is that this is not just about what they learned as part of the course content, but what they sought out to learn externally. To make the need for reflection explicit, the marking criteria for the portfolio are about the student's professional approach: evidence of decision-making, maturity of reflection, professional tone, evidence of life-long learning, acting on feedback and professional attitude. Of the criteria, evidence of life-long learning, causes the most difficulty. Having been the recipients of carefully curated education for years, students have difficulty with the idea of seeking out learning for themselves. The usually response is "Can we just watch some YouTube videos?". The assumption is that any more structured learning is something where they have to pay someone to tell them what to do. Students, I suggest, need to be shown how to go out and find learning for themselves. They also need to be told it is okay if this is outside their discipline, provided their is some relevance (such as soft skills). At and around universities there are many learning opportunities, some formal, some informal. What the student needs to do is work out what they want to learn, what is available for that, how they will know they learned something, and in professional terms, what evidence will they have to show an assessor, or employer, that they learned. At least that is what I tried to get across to the students in the tutorial last week. Just watching some videos what not enough. They had to first work out what they needed to learn, then decide if the videos were suitable, then decide if they had really learned, and lastly provide some documentation of this. As a certified computer professional I am required to do 30 hours of such training per year, with evidence and possible audit of my claims. Finding extra learning at a university and particularly in a university city such as Canberra, is not that difficult. There are free and low cost courses run by the universities and affiliated bodies, such as the Canberra Innovation Network. There are university clubs and societies, such as the ANU Computer Science Student Association. Student membership of professional bodies, such as the Australian Computer Society and Engineers Australia. provides the opportunity to not only attend events, but also take part in running them. The professional contacts come as a by product of these activities, from meeting people. 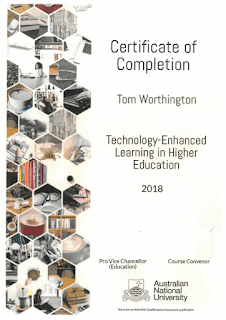 This week I received my ANU Technology-Enhanced Learning in Higher Education Certificate. This required completing ten short online "ANU Coffee Courses" and a 500 word reflection. 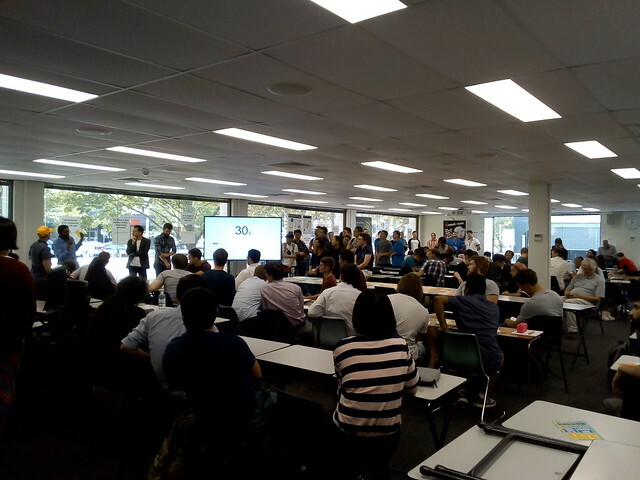 InnovationACT is a ten week startup program and completion for Canberra's university students (with a $50,000 seed pool). IACT starts 14th August. I am one of the mentors (my team last year was OK RDY). Greetings from the ANU Social Enterprise Bootcamp, at the Australian National University (ANU) in Canberra. This is hosted by the ANU Technology Transfer Office. The workshop is being run by Cindy Mitchell, Social Impact Strategist at the University of Canberra and CEO of the Mill House Social Enterprise Accelerator. Cindy has adapted the tools usually used to start-up a new for-profit business to the not-for-profit sector. 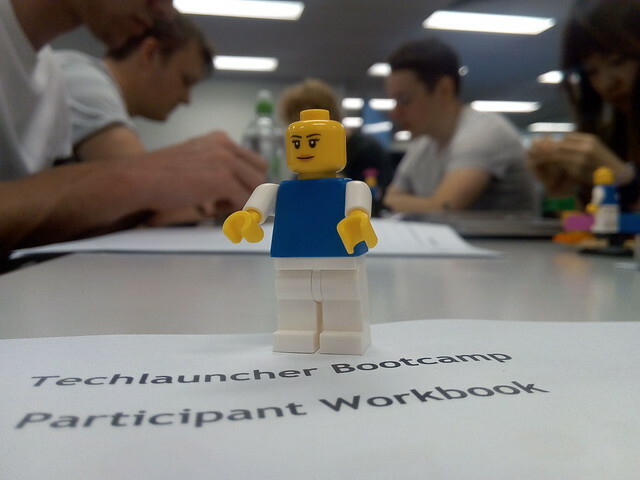 On Saturday I participated in the TechLauncher "Bootcamp" at the Australian National University in Canberra. There were about three hundred students who had been formed into about fifty teams of six students each, after Thursday night's team formation exercise. Each team has a tutor and a client, plus there as some mentors to help teams in areas such as social enterprises. 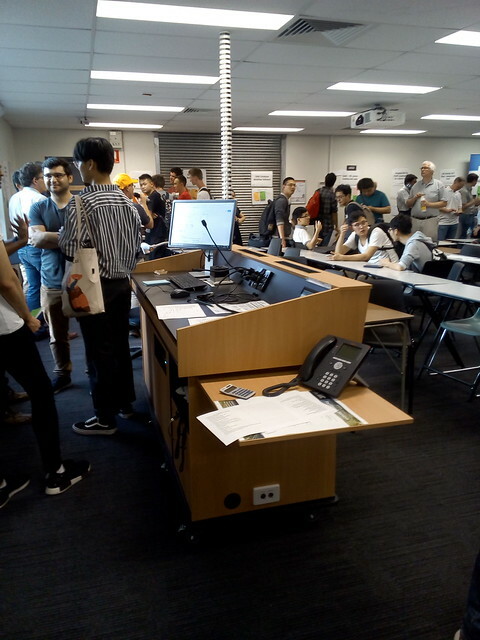 Greetings from the TechLauncher Team Formation event at the Australian National University in Canberra. There are more than three hundred students hearing 30 second pitches from potential clients. The students then select the project they prefer and form a team. They have a year to build what the client wants, which is usually software, but could be engineering hardware. 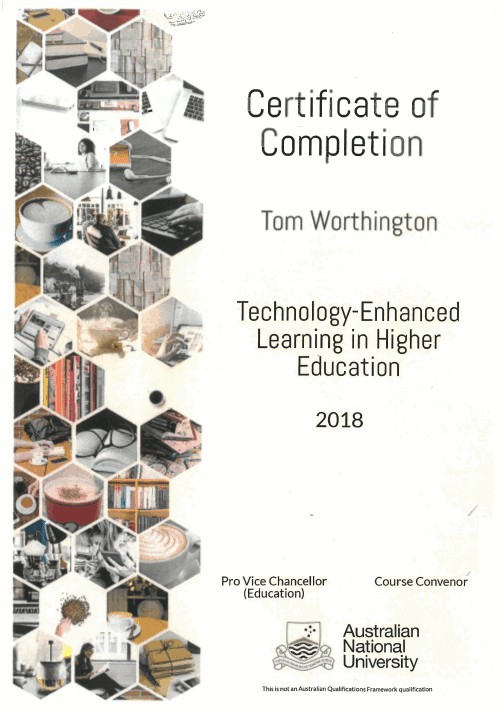 This week I received my ANU Technology-Enhanced Learning in Higher Education Certificate. This required completing ten short online "ANU Coffee Courses" and a 500 word reflection. As with previous such courses I found the difficult part was to keep up the work week after week and then try to make sense of it all in the reflection. This was a pilot program and there may be some changes before it is offered more widely. Students undertake a series of online courses and then may undertake some form of capstone project. Students are offered 25% credit (one semester full time study) towards a Masters, subject to an additional test. This makes the micromasters similar in level and length to an Australian university graduate certificate. However, the micromasters, despite the name, is not itself a qualification under the Australian Qualifications Framework. Australian universities also offer some online degrees and online versions of campus courses, to their own students and those of other institutions. As an example, the ANU offers twelve undergraduate language subjects through Open Universities Australia. In total ANU offers 116 online courses, of these 30 are undergraduate. In Part 8 I decided the task of designing an entire qualification in teaching for computer professionals is perhaps a bit too much. But what quantum is reasonable? What is the current practice at Australian universities to teach those who teach? "Demonstrate understanding of some key elements of learning and how they relate to teaching and to their disciplinary context. Plan, facilitate and evaluate a short teaching session that aligns aims and approach with outcomes. Give and receive feedback to colleagues regarding teaching and to students regarding assessment of learning." From "Beginning to Teach", UNSW, 2018. Curiously, the beginning and foundations courses do not appear to be aligned or nested. The assumption appears to be that all those who are teaching at university undertook basic teacher training as part of a higher degree or post-doctoral training. This assumes a traditional academic career which is increasingly rare and excludes those with non-research degrees and industry experience. A better approach perhaps would be to have the beginning course available to anyone new to teaching, not just HDRs and ECRs. That course would then form the first module of the foundation course. The UNSW Foundations course is aligned with their Graduate Certificate in University Learning and Teaching (GCULT). The Foundations course makes up part of the content of the first part of the certificate. Athabasca University offers a similar on-line course "Technology-Enabled Learning", 3 hours per week, over 5 weeks. There is an earlier set of course materials available under a Creative Commons license. Given that technology enabled learning is now widely adopted, it would seem reasonable to incorporate this in basic teacher training. That is, rather than teaching classroom "chalk and talk" first and then the technology as an afterthought, do it the other way around. I suggest teaching online techniques as basic teaching methods and classroom face-to-face as a variation of that. A free half day seminar on how the Australian National University's newest student accommodation and teaching buildings are built in Canberra from timber, will be held 12:30 pm, 13 September 2018. This includes a guided walk to the building site. "The Union Court Redevelopment project includes a 450 bed student accommodation and 7,000 m2 teaching building to be built using cross laminated timber (CLT) and glulam (GLT). Mass Timber in the form of Cross Laminated Timber and Glulam has finally come to Canberra, with the recent redevelopment occurring within the campus of the Australian National University. Lendlease DesignMake, the designer and fabricator of the engineered timber structures for this project will discuss the design and construction of this redevelopment. Other speakers will discuss mass timber use, CLT and fire rating of timber. 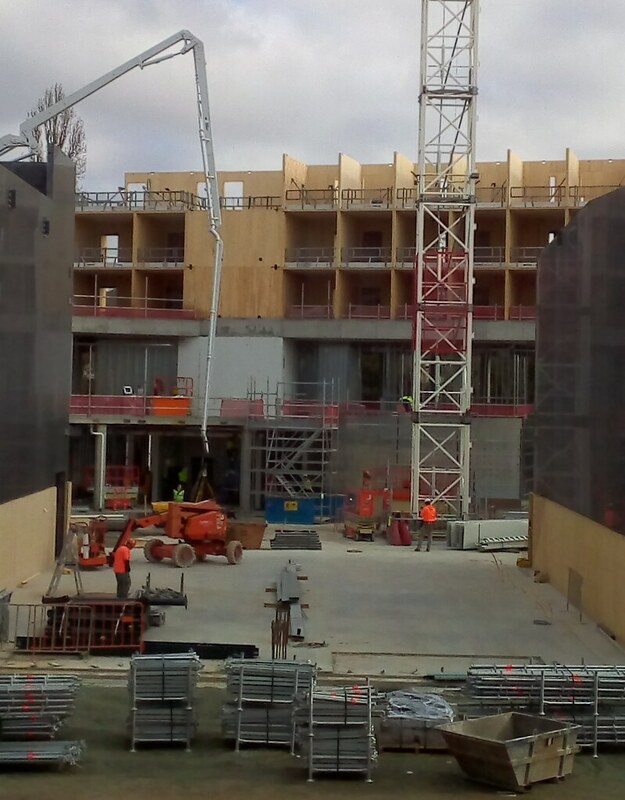 The seminar will also include a guided walk to view the actual construction on the ANU site. Mould & Fire = Destructive Forces & Solutions for Mass Timber - Andreas Luzzi, Laros Indust. From: "Mass Timber (CLT) Building Free WoodSolutions Seminar"
ps: I will be speaking on "Learning to use new tech-infused teaching spaces" at EduBuild 2018 in Singapore, 9 October, 5:20pm. The theme of the Computer Society of Sri Lanka National IT Conference (NITC 2018), 2 to 4 October, is "IT Changes Everything". Australian speakers include Craig Horne the Vice President of the Australian Computer Society, Michael Johnson the ACS Director of Professional Standards, entrepreneur Carey Furze and myself. IT developments depend on trained computer professionals to make them happen. Example: Async-Sync Learning System being built at ANU. Education is an under-recognized specialist area for computer professionals. Example: Free open online ICT Sustainability Course, delivered via the open source Moodle Learning Management System, by ACS, ANU, and Athabasca University for the last ten years. Qualify computer professionals as education specialists at higher education institutions. Accelerate their training, using mobile learning. 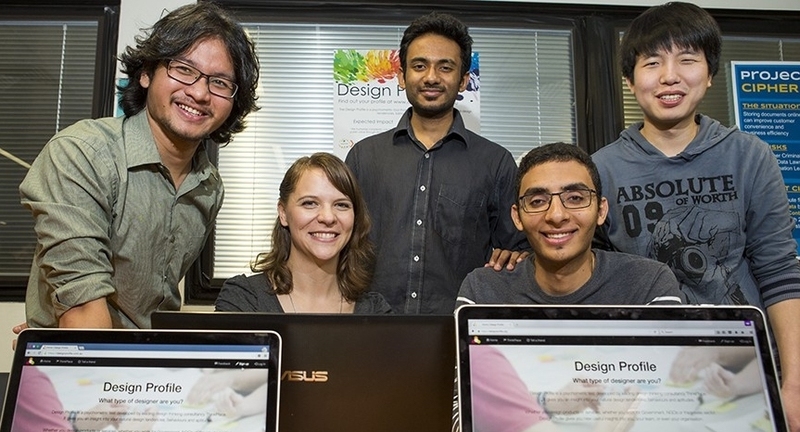 Have these professionals design and deliver mobile learning. Teach these techniques to educators in other disciplines and other education systems. What proportion of your computer educators are dual qualified in computing and education? What proportion of your computer education courses are offered on-line via mobile devices?